Yucca Ridge Golf Club held its ninth annual "Men’s OPEN Championship" golf tournament this past weekend and despite the heat and blustery winds, it was business as usual for one player. 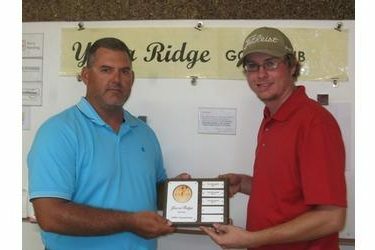 Tyler Brungardt took home the championship for the fourth straight year at Yucca Ridge carding a 7 over par 147 for the two-day total. Brungardt led the field after the first round Saturday shooting two over par 72. Derek Fuller and Johnny Obholz finished the first day tied for second. Tyler Stebens finished fourth after day one. The wind died down for Sunday but the heat was still on the pack to try and catch Brungardt for the lead. Derek Fuller had a good day and carded an 82 in the second round to pull away from Obholz but it was not enough to catch the leader. Brungardt stayed consistent for the second round to finish with the title. Fuller finished second with a 176. Johnny Obholz finished third and Tyler Stebens finished fourth. This is Brungardt’s fourth straight win in the Yucca Ridge "Open” Championship. "We have 5-year plaques hanging on the wall with our winners’ names on them and each plaque has five names on it." said course superintendent Trent Kitch. "His name is up there in four out of the five slots on one plaque so he’s definitely looking forward to next year!" The next event at Yucca Ridge is a 2-person alternate shot format tournament scheduled for Saturday, September 27th. Call Kitch at 482-0243 for info on this tournament or golf at Yucca Ridge. Yucca Ridge is a links style public access golf course located 4 ½ miles north of Liberal off of US Hwy 83.